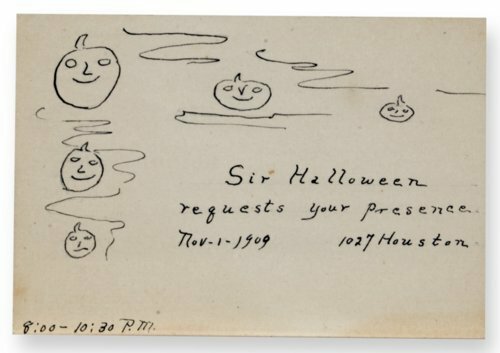 Small handwritten invitation to a 1909 Halloween party. All marks are handmade in black ink on rectangular white cardstock. Five jack-o'-lanterns are sketched across top and down left margin. The invitation was among the belongings of the Mack family, who were farmers in rural Morris County. The address "1027 Houston" may refer to the residence of Mrs. Mary Van Zile in Manhattan, Kansas.